The paper points to four salient features of the world economy during this decade: a huge increase in global current account imbalances (with, in particular, the emergence of huge surpluses in emerging economies); a global decline in nominal and real yields on all forms of debt; an increase in global returns on physical capital; and an increase in the “equity risk premium” — the gap between the earnings yield on equities and the real yield on bonds. I would add to this list the strong downward pressure on the dollar prices of many manufactured goods. The paper argues that the standard “global savings glut” hypothesis helps explain the first two facts. Indeed, it notes that a popular alternative — a too loose monetary policy — fails to explain persistently low long-term real rates. But, it adds, this fails to explain the third and fourth (or my fifth) features. so running larger fiscal deficits, or corporations already flush with profits? This is as much a macroeconomic story as one of folly, greed and mis-regulation. 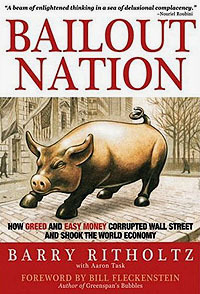 I just finished reading Barry Ritholtz’s Bailout Nation, and it was great. It’s a polemic, mainly about domestic policy and regulatory idiocy, but it’s a good polemic. Well worth reading. But there was a big part missing from it: as Wolf says, better regulation would have reduced the size of the credit bubble and the ensuing crash, but in the end, all the cheap money generated by our persistent trade deficit had to go somewhere. You can’t hold back the tide forever, after all. I guess I’ve been haunted for months by John Hempton’s simple formulation: banks intermediate the trade deficit. If China is sending us huge bales of cash every month, it’s going to end up in the banking system and the banking system is going to end up lending it out. Sure, Alan Greenspan made things worse, George Bush made things worse, and the giddy free market ideology of the Republican Party made things worse. Bill Clinton, Robert Rubin, and the Wall Street wing of the Democratic Party made things worse too. But the underlying cause is, and always has been, our persistent trade imbalances. That was as much a weapon of financial mass destruction as the rocket science derivatives that Warren Buffett so famously criticized. Things have improved on this score recently. Our trade deficit is half what it was at its peak. The problem is that this isn’t nearly enough: eventually, we need to pay down all these loans. That means we need to start running a trade surplus, not merely a smaller deficit. And we have to do this even though oil prices are almost certain to rise in the long term and our dependence on foreign oil is going to continue to grow. I still haven’t figured out how this is going to happen, and as near as I can tell, neither has anyone else. All the options seem pretty grim, though.